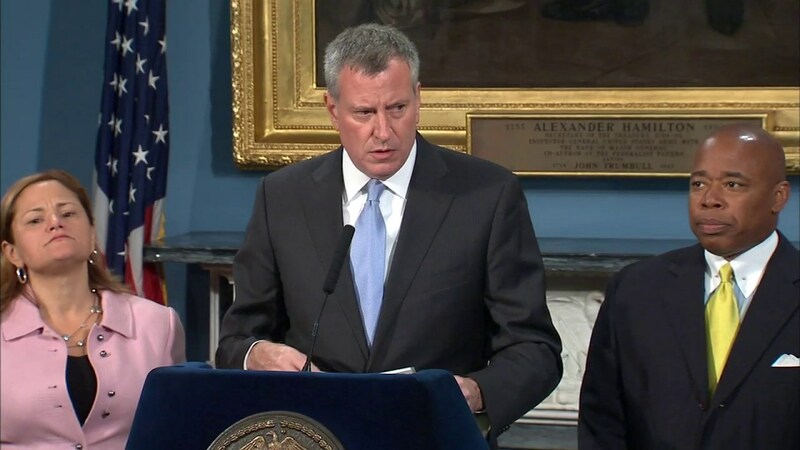 NEW YORK (WABC) -- Mayor Bill de Blasio on Tuesday announced a new paid parental leave policy for New York City employees that allows six weeks of paid time off for maternity, paternity, adoption and foster care leave at 100 percent of salary, or up to 12 weeks total when combined with existing leave. The policy brings New York City in line with the most generous localities in the country, Austin and Pittsburgh. De Blasio will sign an executive order so that the city can provide its approximately 20,000 managerial and original jurisdiction employees with this new paid parental leave policy as of January 1, 2016. Any changes to benefits for represented employees must be done through collective bargaining, and the city is ready to immediately enter talks with its municipal unions about extending the policy to their covered employees. "Too many new parents face an impossible choice, taking care of their child or getting their paycheck," de Blasio said. "New York City is leading by example, putting us at the forefront of paid parental leave policies around the country. This is a common-sense policy that will make for healthier and more financially stable working families, making it good for employees and employers." To cover the $15 million cost, the non-union employees will give back two vacation days, and the city will take back a small portion of a planned 2017 raise.